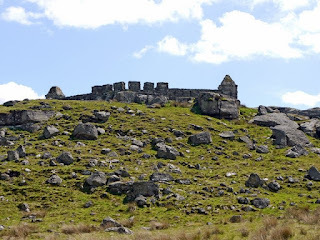 If you’re looking for examples of the useless excesses of the upper classes, then you can do little better than run your eye over the rocky outcrops around Rothley, Northumberland. For, hereabouts, you will find several pointless indulgences of the very rich Sir Walter Blackett (1707-77) of nearby Wallington Hall. Firstly, there is Rothley Castle, a mock medieval stronghold designed by Daniel Garrett and built in 1755. Then there are the Rothley Lakes: man-made creations, and again built by the above mentioned Sir Walter. Several eminent architects and landscapers are rumoured to have been involved in their planning and execution – among then, notably, Lancelot ‘Capability’ Brown. Finally, there is Sir Walter’s daftest effort, Codger Fort. Sitting on a rocky eminence by the roadside of the B6342, it looks very much like it has been hurriedly put together by a giant toddler – and may just as easily, perhaps, be accidentally knocked over by a clumsy playmate. Having sped past it numerous times, I was never quite sure what to make of it. It transpires than no one else has been able to make head nor tail of it either, in fact. It certainly seems to have been erected by the aforementioned Blackett; local legend holding that it was built as a genuine defensive structure against the Jacobite Rebellion of 1745. However, thanks to documentary evidence unearthed at Wallington Hall, it is now accepted that it was no more than another of Blackett’s pointless follies, and probably thrown up on his orders around 1769-70 by a certain Thomas Wright. And, as it is sits so neatly above a fold in the aforementioned Rothley Lakes, this seems as likely an explanation as any. But why ‘Codger’? Well, they say it used to be known as ‘Cadger’s Fort/Castle’. But other than that, I can’t help you. Winter’s Gibbet, or Stob, at Steng Cross, near Elsdon, is one of the region’s most infamous landmarks. It stands, somewhat eerily, in an isolated spot high in the midst of the bleak Northumberland Moors – a reminder of the hanging of one William Winter in 1792. Winter was a highwayman and a wanderer who, one night in late 1791, sought shelter from an old woman by the name of Margaret Crozier (some sources give her name as Elizabeth) in her cottage near The Raw Farm on the Rothbury-Elsdon road. During the night Winter and his accomplices robbed and killed the woman – but they were tracked down, tried and executed at Westgate, Newcastle. After sentence had been passed, the judge ordered Winter’s body to be hung in chains until it rotted in the hills above Elsdon. The original gibbet has been replaced on at least one occasion with a replica, and a concrete head now hangs from the noose rather than the morbid remains of Mr Winter! 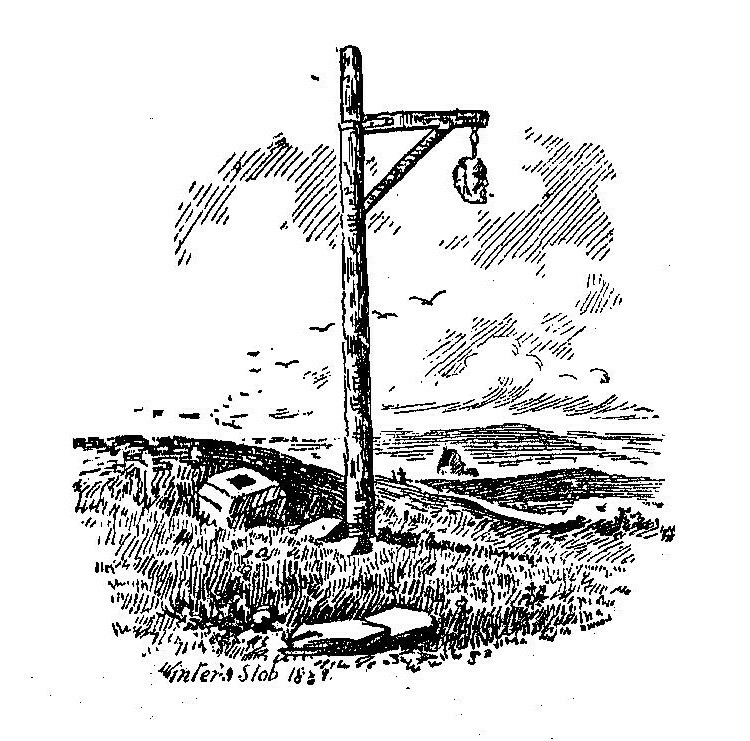 Slivers from the original gibbet were sought by nearby villagers as they were reputed to be a cure for toothache. Near the site can be found the base stone of an Anglo-Saxon cross – the original ‘Steng Cross’, a boundary stone which marked the highest point on this former drove road. 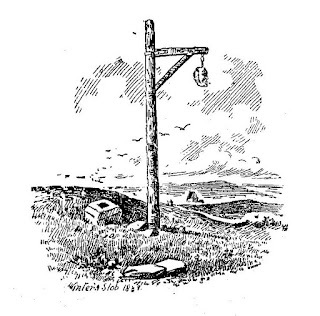 The illustration is taken from the Monthly Chronicle of North Country Lore & Legend of March 1890 (artist Robert Wood), which shows the spot a few years after the original gibbet had been replaced. It looks pretty much the same today. Hundreds, possibly thousands, of innocent, decent folk wander across the Simonside Hills every year. The upland trails to the south of Rothbury carry the rambler through a varied landscape rich in ancient history (cup and ring marks, et al), but what most don’t realise is that they are trespassing on the land of the Duergar, a breed of malicious dwarf which roam thereabouts with the sole aim, it seems, of leading the likes of us astray and, possibly, to our doom. You don’t hear much of them nowadays, but until Victorian times the annals are scattered with references to these pesky little critters – and none of the stories are especially happy affairs. The word ‘Duergar’ comes from the the old Norse word Dvergar, meaning dwarf. And the particular breed which inhabit the Simonside Hills are a troublesome lot. At about half the height of a human, they pop up at night, or in the gloaming, when a hiker is beginning to tire and may possibly be lost. They are dressed in earthy colours – brown and/or green – and always seem to be in a distinctly grumpy mood, as if the unsuspecting human is trespassing on their land. There will then be an awkward encounter, during which the victim will be variously teased and lured into danger, before some distraction (or the returning daylight) causes them to evaporate into thin air, leaving the traveller nonplussed. One tale has two hunters encountering just such a creature whilst resting near a brook. A red-eyed, angry little personage popped up on the opposite bank and berated them for encroaching upon his patch. When offered the fruits of their hunt as recompense, the dwarf became yet more incensed as he never fed on living creatures. In time, the little man tried to entice one of them home, but on the call of his colleague a few yards distant, the duergar vanished. Occasionally, a gang of duergars would emerge from the shadows and set about some poor individual, sending them running and flailing for their lives. Shepherds of old would regularly bear witness to their comings and goings, too. A common feature is the presence of alluring lights – the duergar appearing as will-o’-the-wisp-like characters, but always disappearing as dawn breaks, or when the ‘spell’ is broken by some other sudden event. Anyway, I just thought I’d warn you. In the early months of World War II the threat of German invasion was very real and widely feared, even in the far north of England. The wide expanses of open beaches seemed ready-made for an amphibious landing by the Nazi hordes – hence the proliferation of concrete pillboxes on the North-East coast. But, as you have probably noticed on your inland travels, these gruesome structures are to be found scattered seemingly liberally almost everywhere. There was nothing random about the pillbox network, though. It was remarkably well-planned, with lines of defence arranged at strategic points across the landscape. One such ‘barrier’ was the Coquet Stop Line, which ran along the course of the River Coquet from the coast at Amble to a little above Hepple in the upper reaches of the valley. 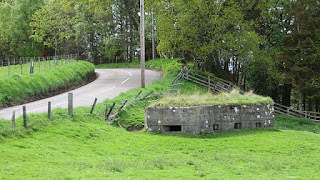 The pillbox illustrated above is that situated a little to the SW of Hepple where the B6341 runs close to the river. It is a typical ‘lozenge-shaped’ affair, and faces north, with open expanses in front and an easy escape route to the rear. The line as a whole was designed to slow any German advance from the north towards the precious strongpoints of Tyneside further south. There was another line, the Tyne Stop Line, 30 miles to the south, where it was hoped a large field army could be assembled if sufficient time could be bought. The pillboxes were, of course, never needed and are now stubbornly melting into the landscape some 70 years after their construction. Around twenty of these wartime relics have been identified as part of the Coquet Stop Line, with a handful having been lost completely to nature and modern development. They may not be pretty to look at but the World War II pillbox is certainly a thought-provoking feature of our modern-day landscape.